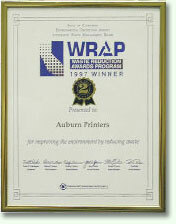 Our company is proud to have received the WRAP Award for almost every year from 1996 to 2011. One of the more unique recycling policies here is buying our employees lunch! With the money received from recycled metal plates used for printing (approximately 100 lbs. per week), we frequently provide a restaurant take-out lunch to our employees. Money from recycled cans and bottles also goes into this fund.